Just because you’ve cut the cord doesn’t mean you want to be disconnected from one of the wildest events in sport: The NCAA men's basketball tournament. With the right setup, you don’t have to miss out on any of the 67 games that can easily take over your life during the next couple of weeks in March. And even if you do have cable, the right setup can empower you to turn your living room into a multi-screen, basketball streamfest. Here's what you need to ensure you don't miss a buzzer beater or upset. 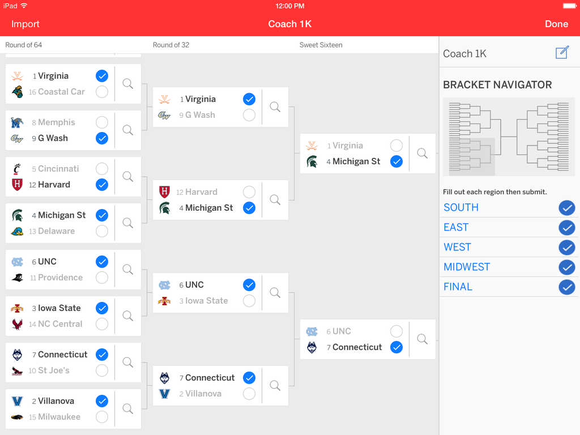 This is the easy part: NCAA March Madness Live is the tournament’s official app for all the streaming, with freshly updated versions for iOS and Android. This is the only app you need if you want to stream all the games. The March Madness Live app streams every game from the 2015 tournament. Unfortunately, there’s a catch. To get access to every game you must sign in with a cable or satellite TV account; otherwise, you’re stuck watching only the games that CBS chooses to broadcast. That will get you the Final Four and the championship game, but you’ll miss out on much of the action from the second and third rounds, when the bulk of the upsets happen. There’s a trial period if you don’t have any type of satellite/cable account, but it will shut you out after a brief preview. One of the smoothest experiences will be for those on Apple TV. Just launch the NCAA March Madness Live app, launch AirPlay from Control Center (pictured) and whatever’s on your iPhone or iPad will be mirrored to your TV. 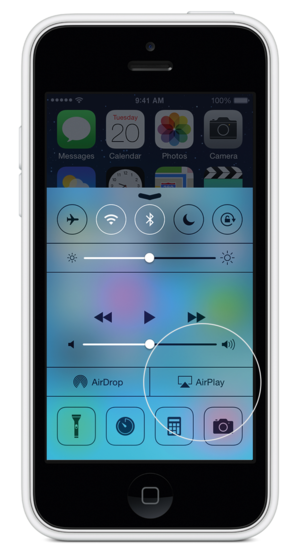 Fire up AirPlay on an iOS device to stream all the action to your Apple TV. AirPlay also works on the Mac. If you want to stream the games using your MacBook, just go to NCAA.com and sign in to the March Madness site with your TV credentials and mirror your display. Just like AirPlay, Google’s Chromecast is your streaming solution if you have an Android device or want to stream from your Chrome browser. 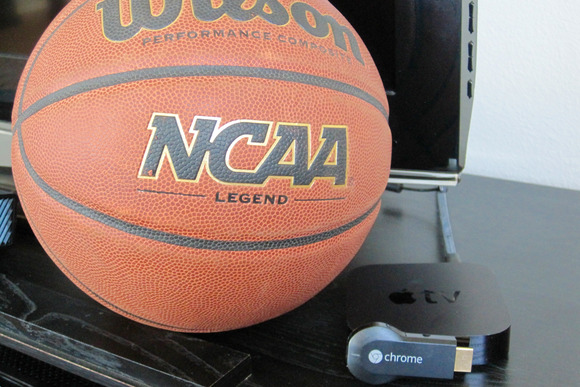 Unfortunately, the NCAA March Madness Live app did not include Chromecast support when updated this week for the 2015 tournament. If the developer doesn’t reverse course, you’ll need to mirror your Android device’s screen to your TV. The same applies if you’re one of the few and proud with a Nexus Player. You can also cast a browser tab to your TV—just make sure you have the Google Cast extension. If you’re into Amazon’s ecosystem, you can grab the NCAA March Madness Live app from the Amazon Appstore and mirror the screen to a Fire TV. Amazon offers a rather detailed help site for making this happen if you're not familiar with using this process. Things are trickier with the Roku, as there is no dedicated NCAA tournament channel from the many options found on the purple-and-black box. You could, however, use an extension like PlayOn, which enables you to cast web content to a Roku box or stick. Some of the most fun of March Madness occurs in the first couple of rounds, when there are four games going simultaneously. This is where a multi-screen setup can be invaluable. 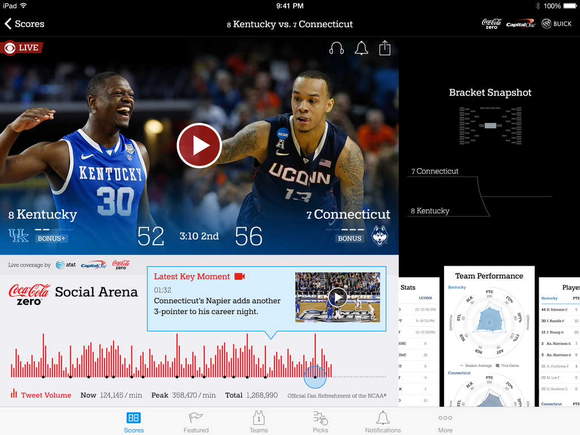 The ESPN Tournament Challenge app will keep you updatd on your bracket's performance. The NCAA March Madness Live app can show any of the games live, so you could have one going on the TV, another on an iPad or Android tablet, and perhaps follow a third game from a mobile device. Or if you're streaming from a computer, put a different game in each browser tab and split up the screen. And don't forget about following your bracket; both the aforementioned CBS streaming app and the ESPN Tournament Challenge let you predict the winner of each game and track your progress. If you do it right, all productivity will cease, especially on Thursday and Friday when these opening rounds see 32 games over two days.